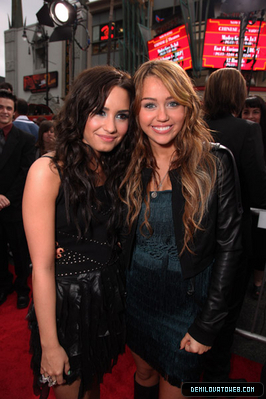 Demi and Miley. . Wallpaper and background images in the Disney Channel étoile, star Singers club. This Disney Channel étoile, star Singers photo contains hip boot and thigh boot. There might also be jambes nues, collants, pantalons moulants, skintight, pantalon skintight, pantalon collant, collant, costume d'affaires, costume d’affaires, bien habillé personne, costume, costume pantalon, tailleur-pantalon, pantalon costume, pantsuit, personne bien habillé, and pantalon de costume.